Five people including a woman were yesterday charged and remanded to Luzira prison by the Law Development Centre (LDC) court over attempting to obtain Shs1.6 billion from a businessman under the guise of selling him pure gold. The suspects including Stellah Birungi Dindi an electrical engineer , David Kironde, Richard Kamugisha , Kibirige Kirimana ,and Yazid Kabonge appeared before Grade One magistrate George Watyekere and have been charged with four counts including, impersonation, criminal trespass, conspiracy to commit a felony and attempt to obtain money by false pretence . They denied all the offenses and were sent on remand at Luzira prison until tomorrow (Thursday) when court will make a ruling on their bail application. Prosecution led by Ms Loy Karungi states that that the accused between December 2017 and January 2018 at Makerere University and Lagrande Hotel in Kampala, conspired to steal Shs1.6 billion from a one Akil Nasri by falsely pretending to be selling him 14kgs of pure gold . The accused are also said to have tresspassed into Makerere University Physical and Chemistry Labarotory with a motive of personating Labaratory technicians of Makerere University in order to defraud Akil of his money. Last week, there was a standoff at City Hall court in Kampala when security operatives clashed with police who were trying to rearrest the five suspects. Court had granted the suspects bail but police swang into action trying to rearrest them, claiming there were new charges against them. A scuffle ensued as the suspects refused to leave court for hours. 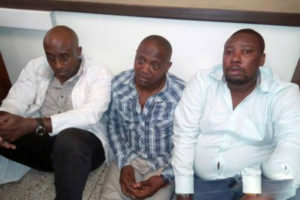 Later plain-clothed security operatives also tried to arrest the same suspects. After hours of resistance, police reinforced and managed to whisk the suspects away amidst protests from them.